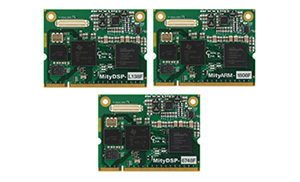 The OMAP-L138 family of MityDSP System on Modules (SOM) includes the MityDSP-L138(F) and MitySOM-1808(F). 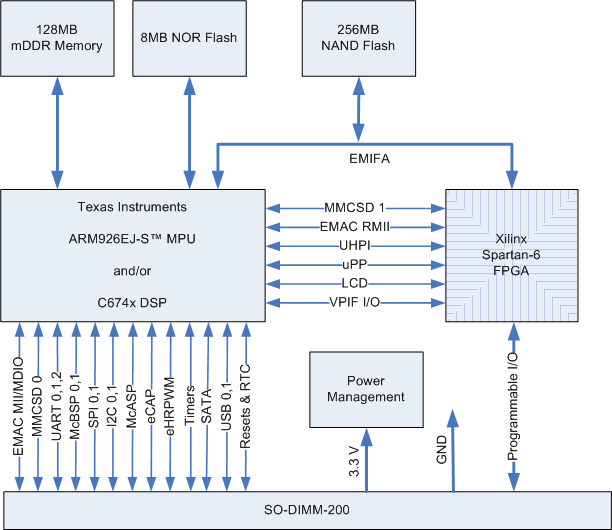 These modules feature Texas Instruments’ OMAP & Sitara families of single and multi-core processors tightly integrated with the Spartan-6 FPGA from Xilinx. This architecture provides system designers with the flexibility to address a wide range of system requirements. Given that all modules in the family are pin-for-pin compatible, and that each is available with and without the on-board FPGA, this family readily handles evolving product requirements, or those of a family of products requiring various levels of processing capability. Note: Interfaces in the OMAP-L138 & AM1808 share I/O pins, contact Critical Link for information on whether your specific set of interfaces are effected by on-chip pin muxing. 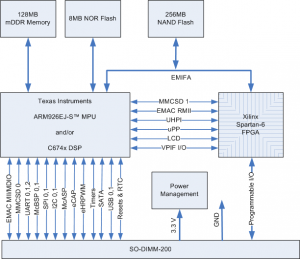 In addition to these integrated interfaces, the on-board FPGA allows for additional standard and custom interfaces to be added to the module’s capabilities. Using Critical Link’s library of available FPGA I/O cores, designers can easily add a variety of additional interface support to their designs, or design their own custom interface or logic to offload the CPU subsystem.